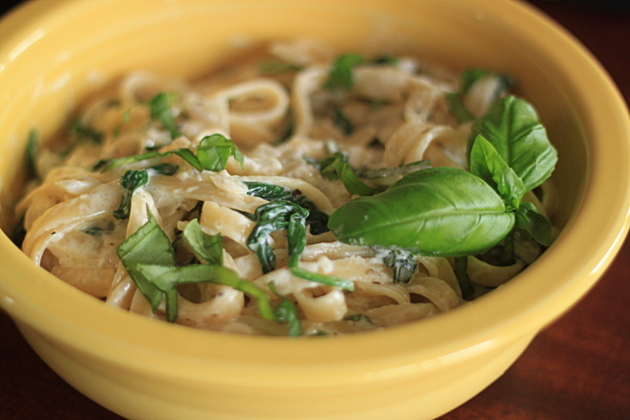 Perfectly al-dente fettuccine pasta, baby spinach, and fresh basil drenched in a rich, creamy sauce. Quick, easy, and delicious. This pasta recipe is the happy result of my starting a batch of fettuccine alfredo only to realize we were out of a key ingredient – parmesan cheese. Nooo! 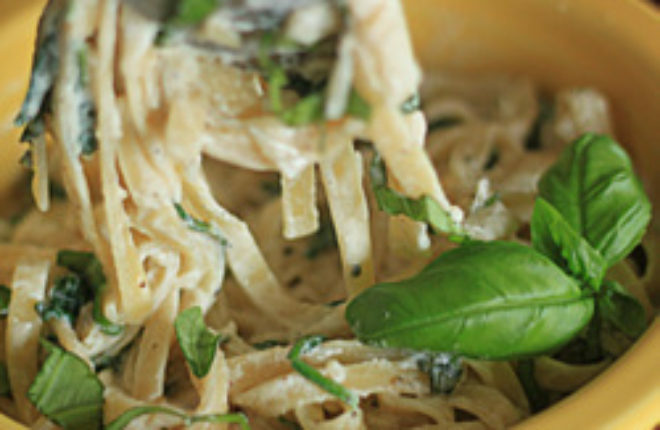 But a little nutmeg, baby spinach, and fresh basil saved the day – and the dinner – and actually elevated this creamy fettuccine recipe to something pretty special. The super-creamy sauce starts with some shallots sauteed in butter. Add heavy cream (diet food it’s not, though I’d like to think the spinach helps), let thicken, season, and add the pasta, blanched spinach, and basil. It whips up in just a few short minutes, but tastes like a million. Even my spinach-hating guy thought it was terrific. In my book, that’s proof positive it’s good stuff, indeed. Fill a large pot with water and bring to a boil. Add the spinach and blanch for one minute. Remove spinach with a large slotted spoon or hand strainer and place in a bowl of cold ice water to stop the cooking. Remove spinach from the ice water and place spinach on paper towels. Squeeze dry and set aside. Add a generous pinch of salt to the boiling water and then add the fettucine. Cook pasta to al dente per package instructions. Reserve a cup of the pasta cooking water and drain the rest. While pasta is cooking, make the sauce. In a large saute pan over medium heat, melt the butter. Add the shallots and saute until tender, about 5 minutes. Add the heavy whipping cream and bring to a boil, stirring occasionally, cooking until the sauce begins to thicken. Season sauce with nutmeg, salt, and pepper. Taste and add additional seasonings if needed. Add the drained pasta, 1/2 cup of the pasta water, and spinach. Toss and cook over medium heat for 3 – 4 minutes until sauce adheres to pasta. Add additional pasta water if necessary. Remove from heat and toss in basil strips (I use tongs for this, they work great). 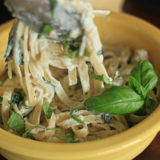 Serve topped with additional basil strips for garnish, if desired, and a hit of freshly ground black pepper. Top carnivores’ portions with a grilled sliced chicken breast. 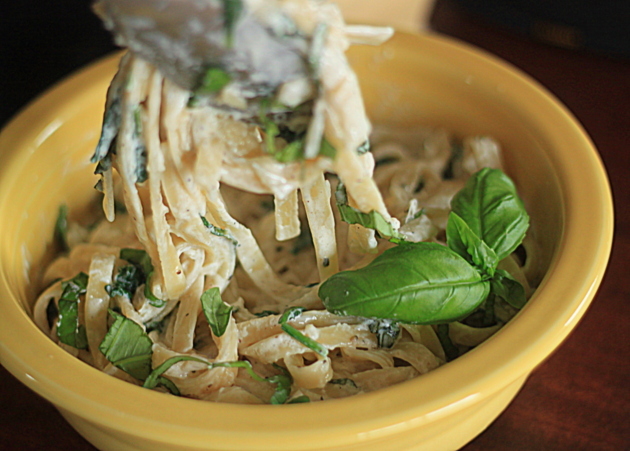 A quick and easy pasta dish, with only a few ingredients. Nothing like forgetting an ingredient, which then allows you to create a better meal.